The analysis of Mitchell’s high-score videos by Donkey Kong Forum moderator Jeremy Young purported to show that all three videos showed evidence of having been created in MAME. Half an hour into the interview, after covering topics such as the King of Kong documentary and Mitchell’s line of hot sauce, the host finally asked Mitchell about Young’s analysis. “I’ve never even played MAME. I don’t have MAME loaded in my home,” Mitchell began. 3) Either a) know that the press conference video is also MAME, or b) organize a conspiracy to swap the tapes being shown that day. 4) In the case of 3a...why wait this long? 5) In the case of 3b...he would have had only a few days to craft a full performance of TWO games (DK and DKJR) faithful enough to fool Billy himself AND convince someone to swap the tapes at the event. 6) Apart from 3a, he would need to craft at least 2 full-length (~2.5 hours) games to match the independent footage. These would have to match Billy’s original gameplay, pixel-for-pixel, frame-for-frame. 7) Wait, for years, for the right amount of general skepticism and technical knowledge to coalesce. Later in the interview, the host Dave McDonald brought up the subject again: “Let me paraphrase here for a second. There is a tape, that is MAME, that people claim is Billy Mitchell. Everyone says the tape is MAME, the tape is MAME. Blah, blah, blah. It’s possible that it’s not even Billy’s MAME tape. That they’re trying to pass off a MAME-d tape and say it’s Billy when he had nothing to do with it.” Mitchell did not respond. Mitchell speaks to host Dave McDonald on East Side Dave. 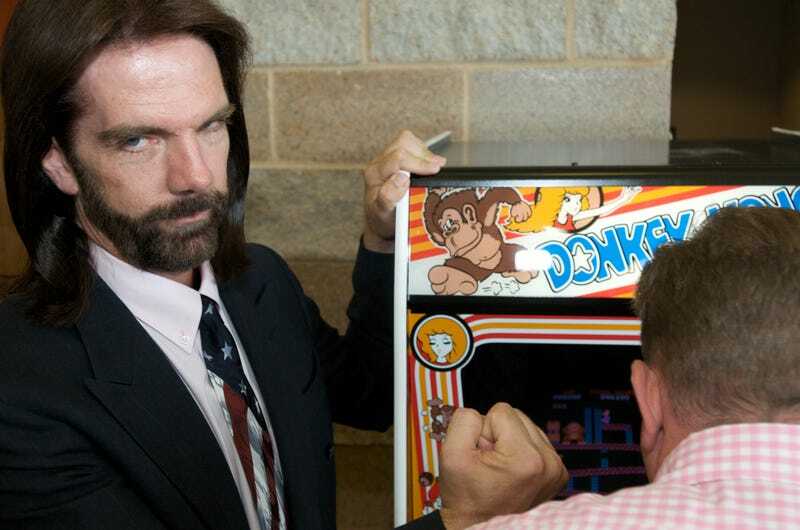 In the interview, Mitchell says that Twin Galaxies referee Todd Rogers (himself recently embroiled in a high-score controversy) witnessed his highest Donkey Kong score when he set it on July 31, 2010 at Boomers Arcade in Dania, Florida, and also says that former Twin Galaxies owner Pete Bouvier was present as well. The “original tape” that he was referring to, he said, was a live recording of the successful high score. The only remaining footage was direct capture of the game itself that does not show the arcade cabinet. “When I absolutely had the good fortune to get the score on Donkey Kong and I turned around, one of the people shaking my hand, one of the people patting me on the back was Pete Bouvier, owner of Twin Galaxies,” he said to McDonald. But during the announcement of his high scores on August 6, 2010 in Ottumwa, Iowa, Mitchell said Bouvier wasn’t in the room: “There was a lot of hugs and kisses and hooting and hollering, and from Twin Galaxies, Pete, was on the phone, and Pete was on his way over,” he said. Whether Bouvier, who passed away last year, was in the room or not, former Twin Galaxies employees said to Kotaku that they have heard of the existence of a video tape recording of Mitchell’s 2010 scores, but that no one can locate it. The interview ended with Mitchell having put forth no substantive defense against the analysis of the gameplay videos. Instead, he focused on the lost video tape of the Boomers high score which he claims will exonerate him if it is located. Twin Galaxies has not made a final decision on the dispute.